The text document was a simple invoice for one of my customers. I emailed an old invoice that had been created in Pages on my MacBook to my iPad. Once I opened the attachment in Mail I was given the option to “Open In Pages.” It shows as a button in the top right corner of the document if you have Pages installed. I updated the document, including a header field, saved it and emailed it to my customer as a pdf in less than 5 minutes. I was pretty impressed. 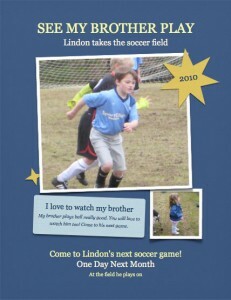 I took the inspiration for the poster from a conversation with my 4 year old at her brother’s soccer game. I used one of Apple’s templates almost without modification. I was able to type in the new text, replace the images, alter the number of points on the stars/blasts and email a pdf version in less than 6 minutes. Though I didn’t make many changes to Apple’s template I am still impressed with the speed at which I was able to create my first poster in a new application. So what can I tell you after a very quick look at the product? The app and the iPad are fast and there were no crashes. The slowest part of the test was me. Though I didn’t put Pages through enough testing to do a comprehensive review, I did use it enough to discover it is worth it’s $9.95 price tag. Other developers are going to have to work hard to deliver a better value to performance ratio. Pages for iPad is available in the App Store now, and is priced at $9.95. This app was independently purchased by the post author in the iPhone App Store. For further information regarding our site’s review policies, please see the “About” page. Of my initial first blush of the iPad at the local Apple Store, I have to say that the Pages app surprised me the most. I'd never used Pages before and was throughly impressed. After you type a document in pages can you get your wireless printer to print it out?